This Wednesday marked International Day of Forests. It is a day to celebrate the importance of forests throughout the world. It provides a platform to raise awareness of the importance of all types of forests and trees, and celebrate the ways in which they sustain and protect us. Forest is generally considered as an important resource for rural livelihood, as most people in rural areas are directly dependent on the goods and services derived from forests, especially in countries like Nepal. However, this does not mean that forest is not useful in urban areas. Forest is equally important for sustainable development and a healthy urban environment in the face of growing urbanization both in developed and developing world. More of us live in cities than at any point in human history. The unprecedented urbanization has polluted concrete urban sprawl. Forest in the city is known as urban forest. Urban forest can be developed as roadside plantation, urban parks in public spaces, trees and parks in privately owned land, and even in the form of green infrastructure and housing. These forests help reduce the unintended environmental impact of urbanization and create cleaner, greener, and healthier places to live in for both current and future generation. This is particularly important, as six billion people will live in cities by 2050. Forests and trees in the city are the important carbon store, which helps in mitigation of and adaptation to impacts of climate change. Moreover, trees improve local climate and help save energy used for heating propose by 20-50 percent. Urban forests play a crucial role in pollution control. Besides, trees in the cities are excellent air filters, which remove fine particulates and harmful pollutants and reduce the noise pollution to a large extent. Trees shield homes from nearby roads and industrial areas. Forests in the cities area can cool the air up to eight degree Celsius, thereby reducing need for air conditioning by 30 percent. Forests in and around the cities are important for wildlife preservation and water regulation. For example, the well-managed urban forest provides food, habitat, and protection for many plants and animals, resulting in increased biodiversity. Forests help connect nature and people even in urban landscapes, which in turn protect the watershed and prevent flooding by storing the water in the soil, providing water sources to city dwellers. Urban forests are equally important from a socio-economic, cultural and aesthetic point of view. Local people use fruits, leaves, nuts and other products as food and medicine. Similarly, fuel wood generated from urban trees and planted forests on the outskirts of cities provide a renewable source of energy for heating and cooking, reducing pressure and reliance on fossil fuels. Furthermore, well-managed urban park, roadside avenues, and overall urban infrastructure not only enhance the aesthetic beauty, but also support green economy via eco-tourism and creation of tens of thousands of job. Despite this, very little has been done to promote plantation of trees in Nepal. Haphazard road construction in many cities including Kathmandu without taking care of roadside plantation, and urban green spaces has literally defaced the city. Some efforts were put on the roadside plantation, but these lack adequate preparation and proper planning. Dearth of planning could result in environmental hazards along with erosion of road surface. In Nepal urban parks are very rare in major cities. The few we have are being poorly managed. This might be due to lack of clear rules, regulations, and programs to promote urban forests and maintain greenery in the city. It is the reality that Ministry of Forests and Environment, having the expertise and sole responsibility of conservation and management of forests, does not have actual policies and programs on urban forestry. Local governments are also supposed to carry out urban forestry related activities for sustainable development of the cities at the local level, but they have several responsibilities and these activities don’t come in their priority. Even if the local governments wish to do so, they do not have adequate expertise and manpower. There was a saying Hariyo Ban Nepal ko Dhan until the decade of eighties. Green forests were considered to be the big assets of the nation. But they are dwindling. Sustainable development is not possible keeping the nature aside. Green forests are the nature that everybody should realize. The world has witnessed speedy growth of urbanization across the world, but we have failed to maintain a balance between nature and urbanization. The Ministry of Urban Development was formed to promote a healthy urban development but very little seems to have been done so far. There is a need of proper collaboration and coordination among relevant stakeholders for promoting forests and trees in the urban landscape. 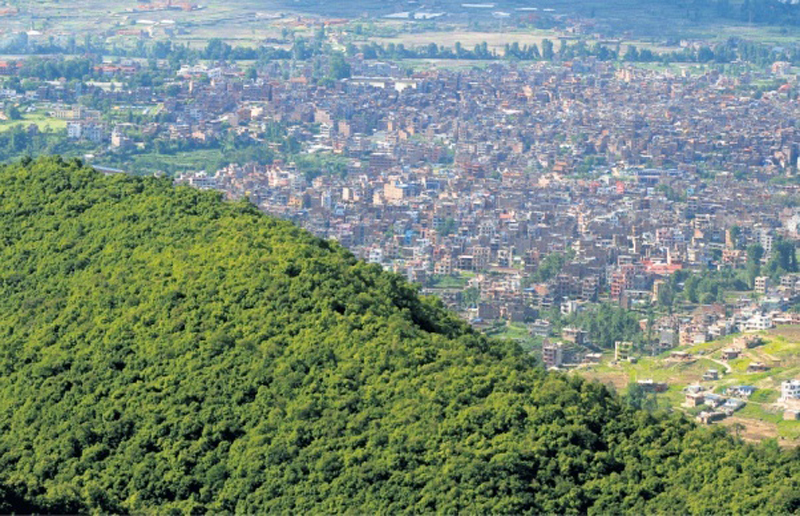 Nepal has a proven track record on forest and biodiversity conservation. So we celebrate conservation-related days such as International Day for Biological Diversity and World Wetland Day, but we are yet to officially start celebrating International Day of Forests. Most of our forest and biodiversity conservation related programs are concentrated in the forest dominated rural landscape. Time has come to galvanize our efforts for the development of healthy and sustainable forests. Observing International Day of Forests should not be confined to formal programs. We need to develop policies and programs and implement them to promote greenery in the urban and semi-urban landscape.